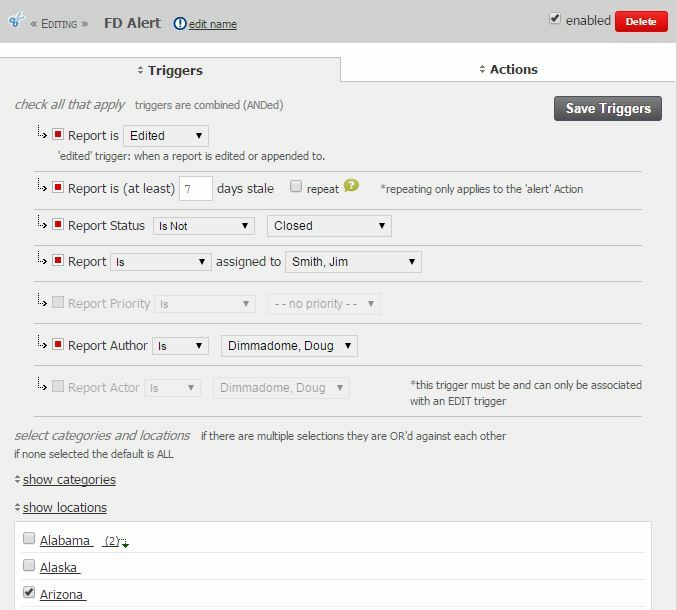 Incident Tracker can sync with your Active Directory to easily and securely manage the users. This can be achieved with LDAP for same sign-on or SAML for single sign-on. 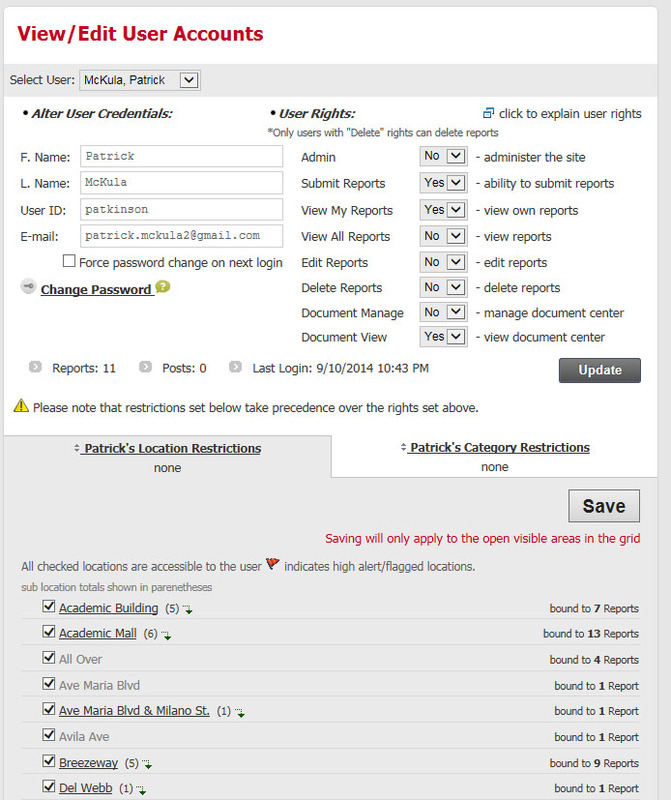 Make your own electronic forms that embed directly into Reports. Save, Query, Print, Email, PDF and more. All the familiarity of any current form you use with the power and flexibility to be stored and search on digitally. Lay out and design any kind of form you can think of. 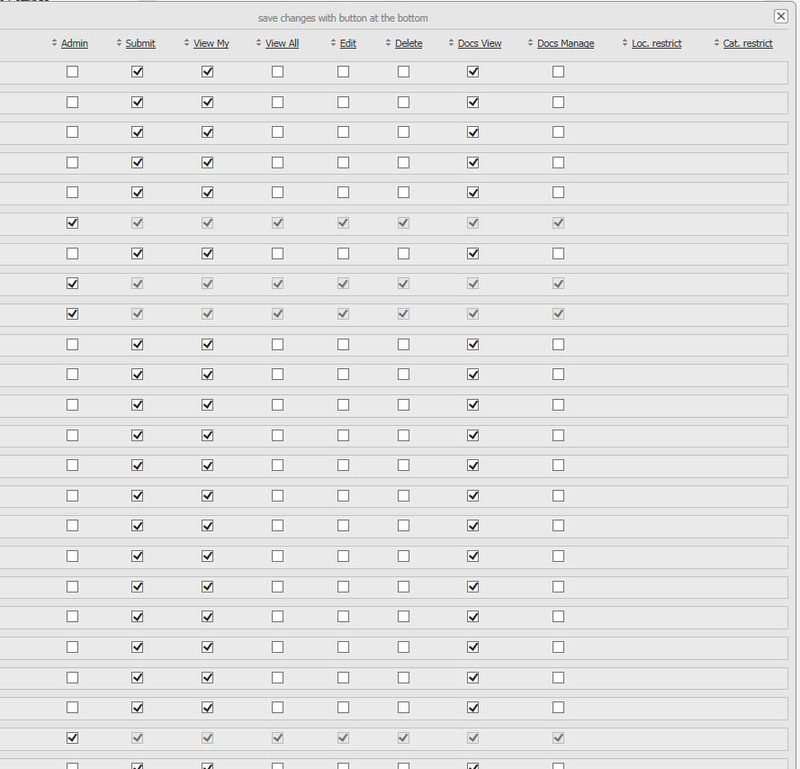 Add labels, textboxes, checkboxes, radiolist buttons, dropdown lists of large area html friendly text boxes. Click here for more on workflows. 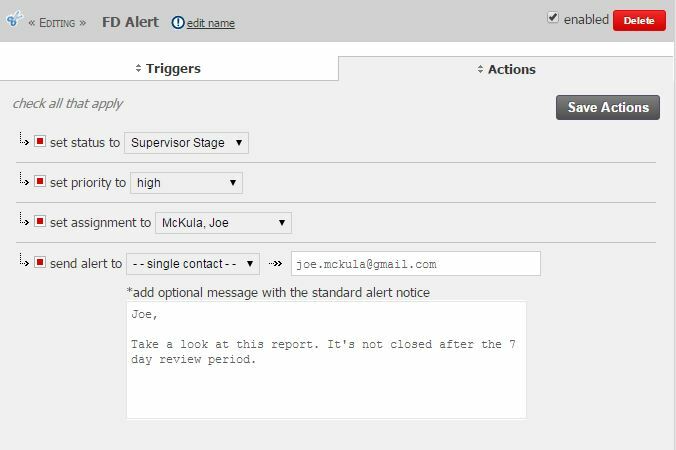 Create Email Lists and Rules to trigger notifications during specific actions. 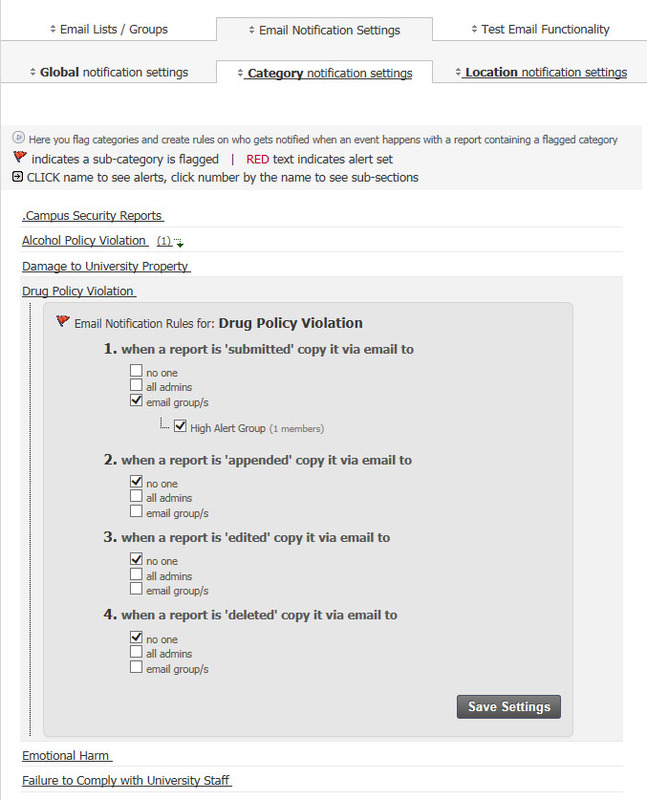 Create assignment Rules based on Report Actions. 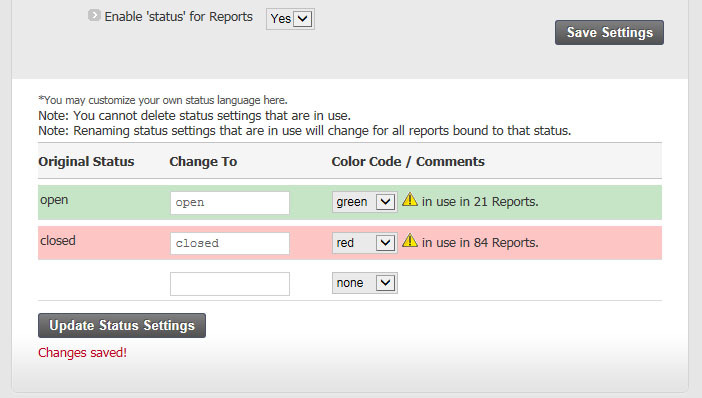 Create your own status types, color them, and apply them to Reports. Build your own statuses list. Color code for easy viewing and querying. 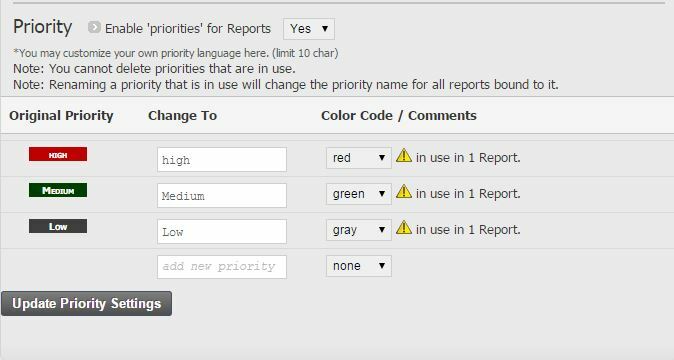 Create your own priorities, color them, and mark the importance of reports. Create your priorities to mark the importance of reports that need completed. 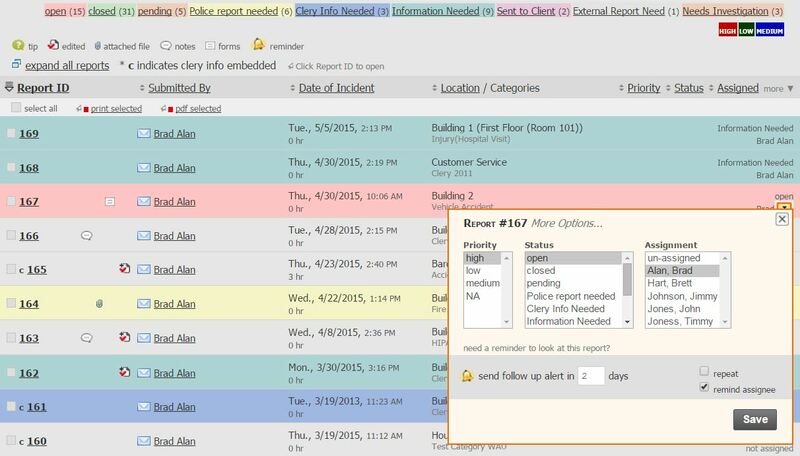 Quickly view the highest priority reports by selecting the priority label. 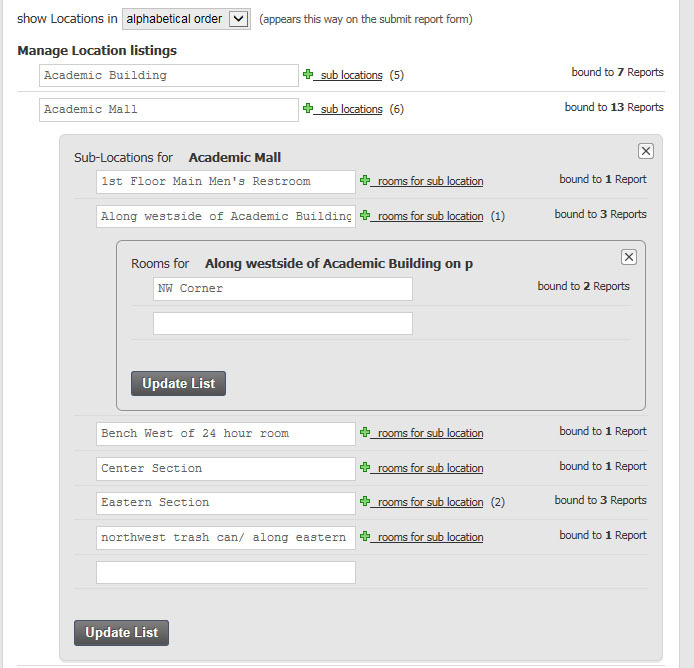 Selecting More Options on a report allows you to pick the priority, status, assignment, and even a personal follow up alert. View Trending and Heat Map data, export to excel for a deeper analysis. 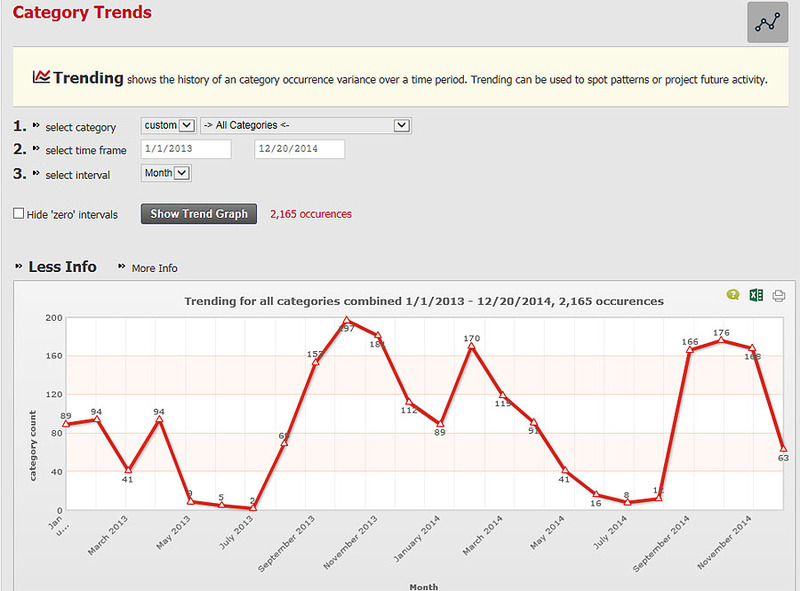 Create trending Graphs over time and category slices. Combine variables to generate a heat map of activity. Dump everything into excel and slice and dice even further. Alter virtually any and every part of the Form to fit your specific needs. Create your own set of two tiered categories. Create your own set of three tiered locations. 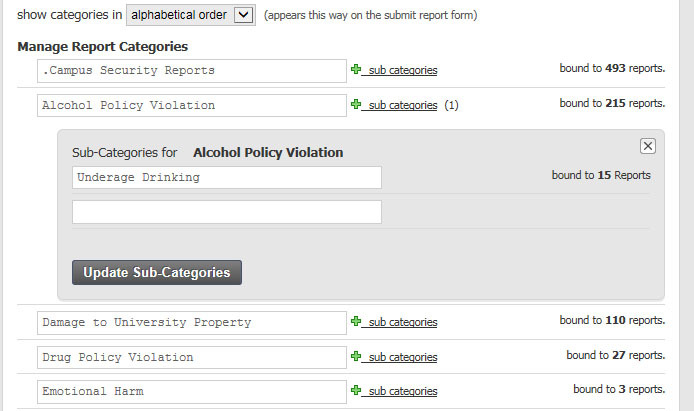 Build custom rules for users (rights and restrictions) and report actions. 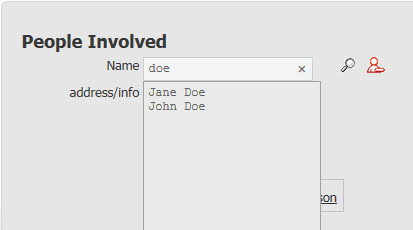 The autocomplete feature allows entered data to be validated against the Report database, no more double entries for ‘Jon Smith’ and ‘John Smith’. 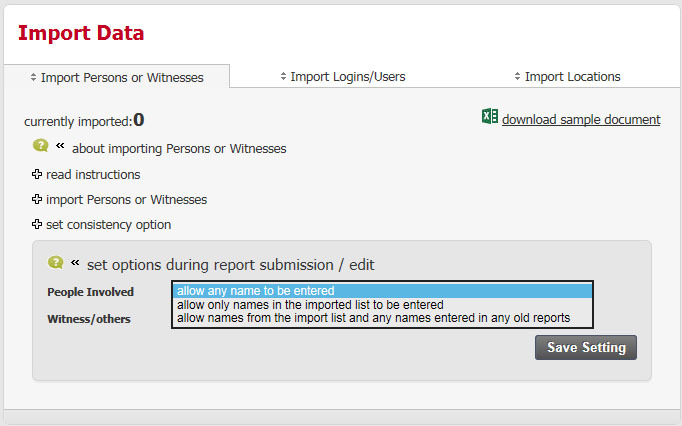 Import Users, People, Witnesses, Locations and more. Lock data entry to your custom list. Auto Complete and history search shows good data to use with new report (avoid duplication errors). Follow every step of the Report Life Cycle. 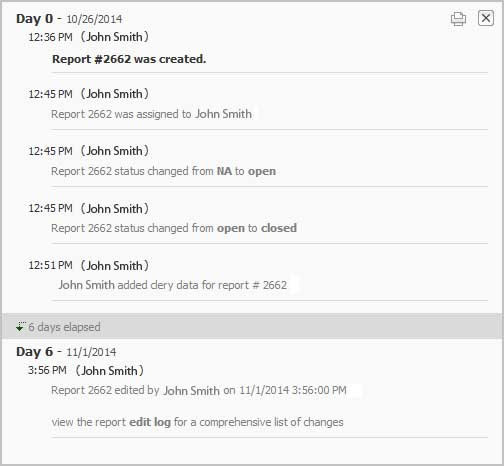 A complete Audit trail showing all actions for each Report. 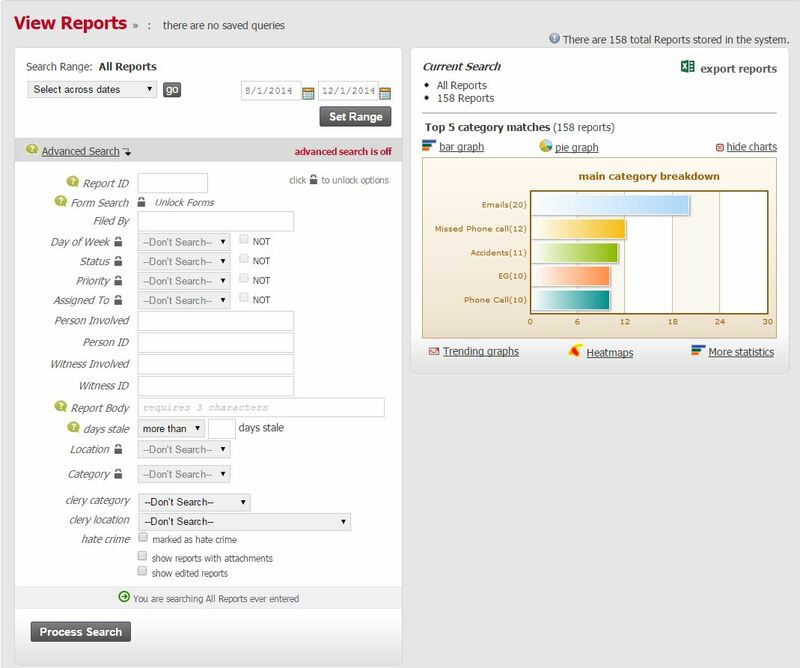 Create profiles of reports by combining search criteria. 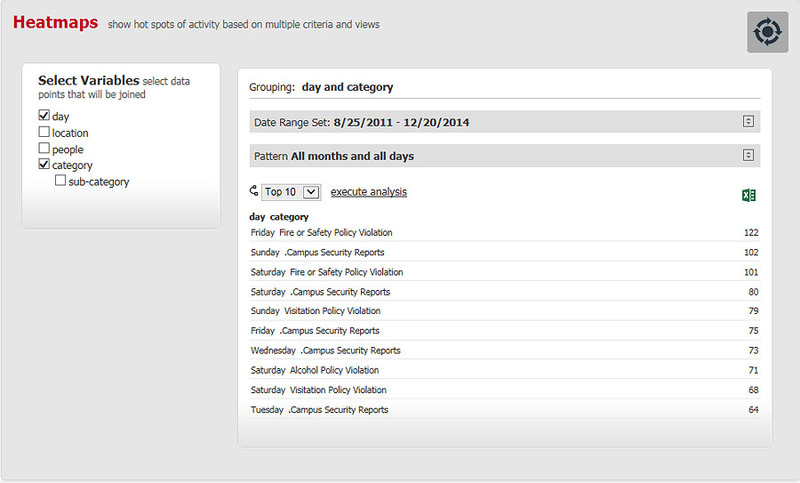 Generate a snapshot of Reports based on millions of combinations of criteria. Grant and Remove access to reports based on multiple criteria. Set restrictions based on category types and locations. Import users, locations, suspects, witnesses, etc… from your own ERP system.